High capacity with high speed colloidal mixer and 400 litre agitator with heavy-duty all steel positive displacement plunger pump. Versatile, economical double drum mixer with heavy-duty all steel positive displacement plunger pump. 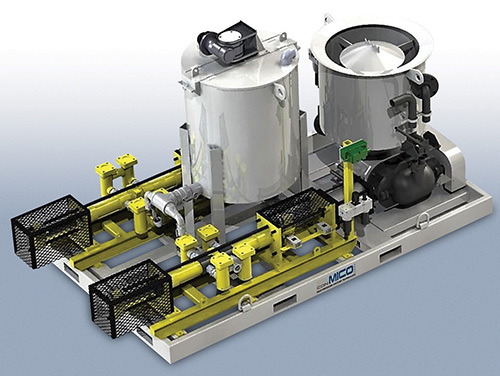 The Co-Pak™ Series 1500 incorporates both the mixer and pump equipment assemblies necessary to provide a continuous supply of grout, cement slurries and epoxies, without variation in material homogeneity. The compact design of the unit allows it to be placed in close proximity to the workface for maximum control and productivity. 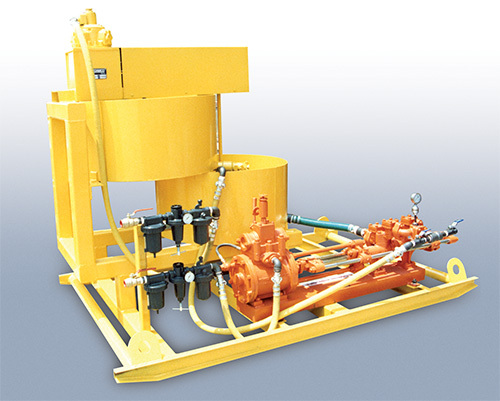 The system is available powered in the very popular pneumatic version, electric hydraulic, or the very portable diesel-hydraulic. Dimensions Size will vary - approximate dimensions: 98" x 63" x 67"
Co-Pak™ system with high speed colloidal mixer and pumps. Co-Pak™ system with versatile double drum mixer.